So if you’re here you obviously have too much time on your hands. However, since you made the effort to pop over to this spot, the least I can do is give you some idea of who I am, what my goals are, and various sundry info. I worked in IT for about 26 years, all of which were done in the heat of Phoenix, Arizona. After much planning, saving of green dollars, gnashing of teeth and generally stressing out, I made the move to Sunriver, Oregon (Water Wonderland II, actually – but who wants to say they live in an area that sounds like an amusement park?). I left IT and have semi-retired in the hopes of focusing on writing. Those of you who have been keeping track will note that despite the move, things are slow going. I promise I am not pulling a George R. R. Martin, and doing everything but writing the next bloody story, but this last book in the trilogy is proving challenging. It is my hope that the result will be worth the wait—you’ll have to let me know once it is done. Once I finish this initial trilogy the plan is to write a few shorts to give out as freebies, and maybe a novella to put out at .99. 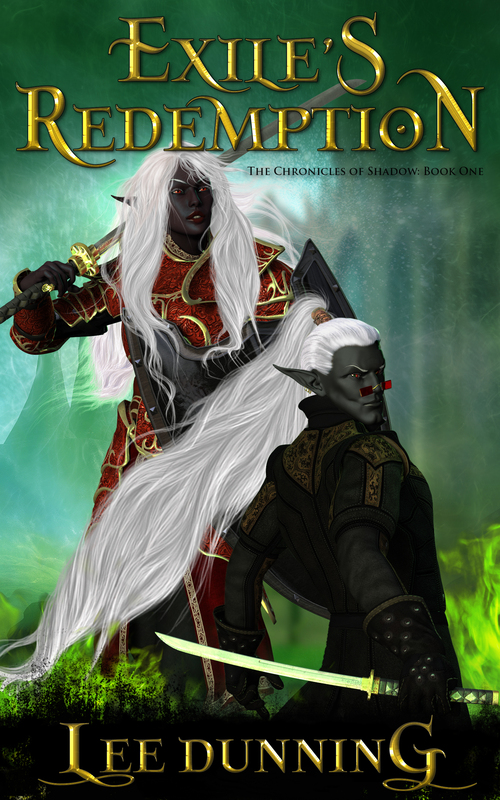 Then I have plans to launch another story in the same universe, but about 100 years in the future, involving Lady Swiftbrook and Lord K’hul’s son, Elladan. Hmm, I guess that could be considered a spoiler. Pretend you didn’t read that. In addition to writing, I occasionally have the pleasure of a book cover commission. Thanks to Chris over at Chris Kennedy Publishing, I receive a new project or two every few months. When I’m not working on a cover, writing, or putting in my 18 hours of “real work”, I spend time enjoying the squirrels, jays and deer hanging out around my house. It’s still too hot for my taste, maybe I’ll have to head further north into Alaska, but for now my little house in the woods of Oregon will do. I read your book. It was really good. When will book two become available? Thanks so much, Alex! It’s a real thrill to have folks tell me they enjoyed the book. As to your question, I’m working on the last 1/4 of the book in terms of the initial draft. I’ll then go back through it and fix obvious problems and try to tighten it up. Then I’ll send it to my editor. As she sends me chapters I’ll make fixes and major changes based on her input. Then it will go to my beta readers who always find more things to fix. Then I have to do the formatting for both the ebook and print versions – yeah, I do everything myself. That’s a long way of saying volume two will probably hit the store around April of next year. That’s obviously a best guess since I can’t be positive how long it will take my editor to get through my gibberish. Just so you know, this book is shaping up to be significantly longer. I will post here as significant milestones occur, like when the last word is written of the first draft. I’ll also post some WiPs of the artwork for the cover as I try to get that shaped up. I also post on Facebook: https://www.facebook.com/profile.php?id=100007645938086 if you care to pop in there to see what I’m up to. Lastly, if you haven’t already done so, and it isn’t a huge imposition, reviews are the lifeblood of indie writers. A short review at Amazon and/or Goodreads would be hugely appreciated. Hey! Thanks for stopping by. Thrilled you enjoyed the first two books so much. There is a third book in the works. It’s definitely taking longer than I anticipated, but the first draft is about 2/3 done at this point. After that I plan on doing two or three shorter pieces – either novellas or short stories. If they’re novellas they’ll be cheap on Amazon. If they’re short stories they’ll be freebies. Once those are complete, I have another novel set in the same universe in mind, but taking place about 100 years after the events in the current series.